Do you have a hard time thinking of creative healthy smoothie recipes? Well... Have no fear, the smoothie gurus are here! Gather some creative smoothie ideas below from other readers just like you! All I knew what to blend, that was tasty, was filled with ice cream or sugared strawberries. It took some time to find good combinations that were healthy. So now that I've gotten several years of blending under my belt, let me help you create your masterpiece. Does your smoothie recipe need a smoothie makeover? 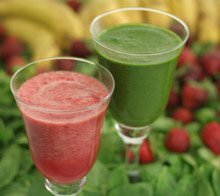 Submit your recipe here, and I'll show you how to transform that not-so-healthy smoothie to an energy-filled health drink! Perhaps, you are one of those health gurus and would like to show off your smoothie making talent. That's wonderful! We all love trying out new smoothie flavors. Let's help those, like me, who need a little creativity spark by showing what you like to blend up! Strawberry Banana Orange Tangy Smoothie Goodness!